Friends, Romans, and countrymen, lend me your ears. It’s time to put an end to this restrictor plate madness at last, before some other driver pays the ultimate price. 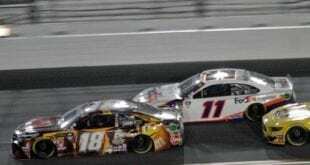 It has been nearly two decades since NASCAR implemented the plate rules as a “temporary fix” at Talladega and Daytona. Tuesday would have been Dale Earnhardt’s 57th birthday were it not for the last lap tragedy at Daytona in 2001; let's ensure that we learn something from that death, and those of many others. Friends, Romans, and countrymen, lend me your ears. It’s time to put an end to this restrictor plate madness at last, before some other driver pays the ultimate price. 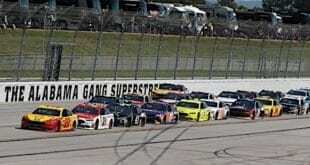 It has been nearly two decades since NASCAR implemented the plate rules as a “temporary fix” at Talladega and Daytona. Tuesday would have been Dale Earnhardt’s 57th birthday were it not for the last lap tragedy at Daytona in 2001; let’s ensure that we learn something from that death, and those of many others. But, a neophyte might object, NASCAR needs the restrictor plates. After all, they were implemented in the wake of a near miss, when Bobby Allison’s out of control Buick tore down a section of the catchfence separating the track from the grandstands in May of 1987. It was at that point NASCAR decided that speeds well over 200 MPH were just too dangerous, and that a stricken car might one day land in the grandstands with horrific results. But let me remind me you, in 1993 Neil Bonnett’s out of control car was also knocked airborne and tore down a section of the catchfence; though once again, perhaps, divine intervention was all that kept the No. 31 car out of the stands. Note in that incident, Bonnett’s RCR Chevy was fitted with the proper NASCAR-mandated restrictor plate under the hood. In that same July race, Jimmy Horton flew over a section of wall not protected by catch fencing, falling three stories into the parking lot outside the track. So, if the intent of the plate rules is to keep the cars from becoming airborne to protect the fans, then they have failed miserably at that job. 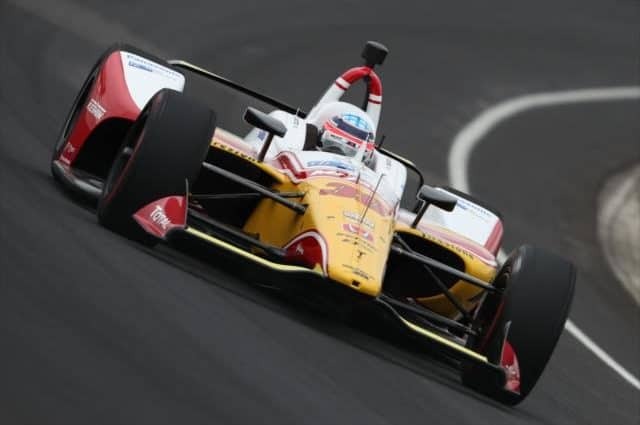 Time is too short to recount all the tumbles drivers like Tony Stewart, Elliott Sadler, and Rusty Wallace have taken at the plate tracks despite wheeling cars equipped with them. And if protecting the fans is the primary goal of the plates, they may have, in fact, made it more dangerous for them to attend a race. With cars reduced to the least common denominator, competitors typically run in three wide packs, ten or more deep, jockeying wildly for position and forming various drafting alliances. 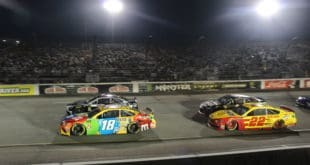 Given the speeds and proximity of the cars, the huge smoking wreck the TV types call “The Big One” is a routine part of plate racing that happens more often than not. When things really go wrong — and they do so often — cars start tumbling, shedding parts as other drivers inevitably run into same of that airborne flack. One such wreck in the 1990s sent Ernie Irvan’s hood into the grandstands; fortunately, it caused only minor injuries. 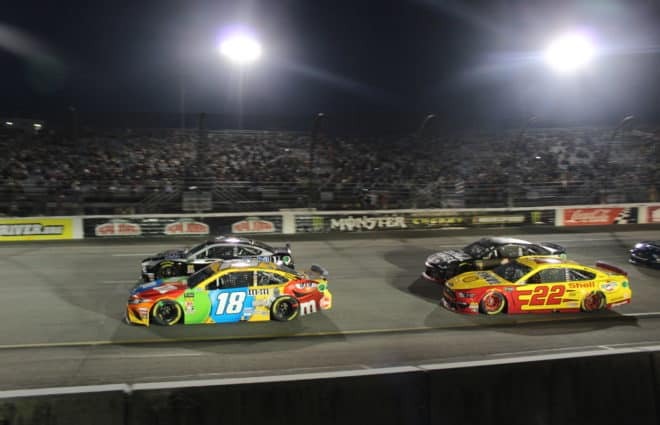 NASCAR has made well intended efforts to tether tires, hoods, and decklids to the cars, but even an object as small as a coil spring entering the stands at over 100 MPH can potentially cause incalculable tragedy. So in summary, the plates don’t keep cars on the ground, and they cause more wrecks putting both drivers and fans at plenty of risk. “But plate racing is exciting,” others contend. Look at all those leaders and passes for the lead last Sunday! Um, racing at Talladega in the days of yore was exciting as well, back when the cars resembled their stock counterparts but lacked the plates. In the 1984 May Talladega Cup race, there were 75 lead changes. In the July Talladega race that year, there were 68 lead changes, and a thundering pack of ten cars took the checkers in such close formation that, while almost everybody knew Dale Earnhardt had won, it took hours and the use of three start/finish line cameras to figure out where those other nine drivers finished. The plates, in fact, have ended what was one of the more exciting parts of the Talladega and Daytona races in days of yore. Back then, the last place a driver wanted to be running at the white flag was in the lead. The second place driver could use aerodynamics to make a slingshot pass and take the lead at will back when the cars punched bigger holes in the air. And it wasn’t unusual for the fourth place driver to pull out and blow by the three leaders, either. Keep in mind that in those days, a single car could pull out and make such a pass; he didn’t need a drafting partner pushing him from behind to make his move. Yes, modern day plate racing is exciting, but it’s contrived excitement. It can be interesting to watch, of course, as driver’s strategies play out or fail as they did on Sunday. But like many folks I talk to, I watch today’s plate races with a gnawing in my stomach, waiting for the big wreck to happen and wondering how bad it’s going to be. Once the inevitable occurs, I wait, hoping to see each driver emerge from their car uninjured. Only then can I laugh at the madness of it all. During a typical plate race, I will chew down an entire roll of Tums; that’s not entertaining to me. I liken watching plate racing to watching a teen slasher horror film. But, some tell me, you’re in the minority there. Most fans love the plate racing. Do they then? Here’s what I find interesting. Sunday’s Talladega race drew a 5.2 Nielsen rating. The Martinsville Cup race drew a 5.3 rating, while this Spring’s Texas Cup event drew a 5.4 rating. I guess if fans love plate racing, they really must love Texas and Martinsville racing. Or, maybe the sort of fans who really love plate racing don’t own TVs? Yes, Talladega can still draw a big crowd on Sundays, but Talladega drew a big crowd before they added plates, too. Talladega race weekends are as much an event as a competition, much like the Bristol night race. A lot of folks wouldn’t care if they were running lawn tractors during the race — just as long as the partying kept right on going. 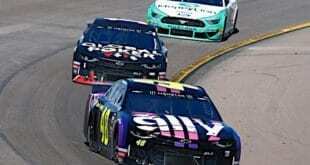 In an era where NASCAR claims to be trying to reign in the costs of running a race, team plate racing also flies right in the face of that stated goal. Teams must spend millions annually on engines that will run in just four of 36 points races each year. And the costs of replacing a car wiped out in one of those big wrecks (and some team owners will lose more than one in each of the four plate races) is expensive, as well. Next time you’re watching the aftermath of a big wreck at Daytona or Talladega, imagine you are watching a couple million dollars in cash going up in smoke. Yes, team owners have cars demolished at other tracks, but the numbers are larger and the damage is typically more severe at Daytona and Talladega more than anywhere else. One design goal of the Car of Tomorrow was that its decreased aerodynamics would allow them to race at Talladega and Daytona at reasonable speeds, so the plates wouldn’t be required. In that context (and others), the new car has failed miserably. I figured they’d still need plates at Daytona and Talladega even with the Ugly Pup cars, and I wasn’t disappointed. 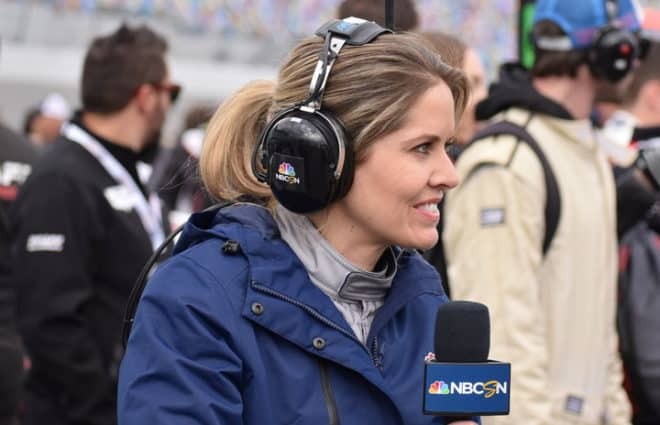 My fear is with advancements in safety like the HANS device, better seats, Roush flaps, SAFER barriers, and the door foam in the Ugly Mutt cars, fans, track owners, and even some drivers have grown nonchalant about the crashes. They think that no matter how bad the wreck, no one could die. Well, they still can; and when it comes to the safety of drivers and fans, I am still decidedly chalant. The first would be to reduce the size of the engines Cup cars run at the current plate tracks, down to somewhere around 4.6 liters. The old hot rodder’s axiom goes, “there ain’t no replacement for displacement.” The goal of the smaller engines would be to reduce horsepower down to the level of the plate engines, but without the plates so drivers would have better throttle response. 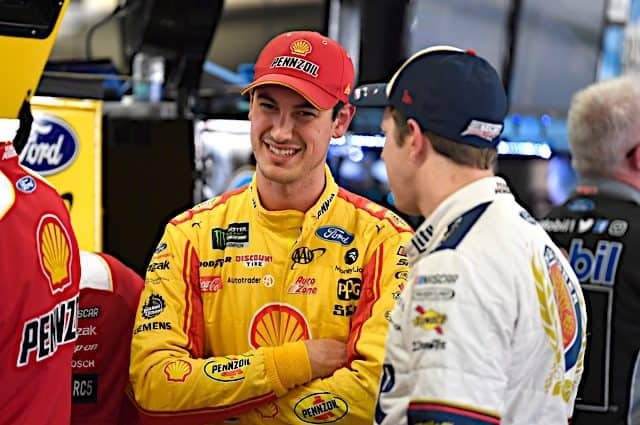 In fact, in a perfect world, the new smaller engines might run on all the tracks, because it’s been shown time and time again in oval track racing that lower speeds actually make for better action with more side-by-side racing and passes for the lead. But I’m uncomfortable with that solution, as once again it dumps the bill for fixing the problem into the team owner’s lap. Once again, they are forced to dump expensive inventory that is no longer legal, and to pay millions to develop the new smaller powerplants. No, I feel this time International Speedway Corporation, which owns Daytona and Talladega, should foot the bill. It’s time for them to tear up those two tracks, reduce the banking, and configure the corners so that drivers don’t just hold it wide open the whole way around the track. With modern computer simulation, it would be possible to find the ideal degree of banking that allowed for the lower speeds and better racing to occur. Do it once…and do it right. If Bruton Smith owned Talladega or Daytona, the fixes would have been made years ago; and if he balked, NASCAR would have threatened to take race dates away from him. Yes, it’s going to be expensive for ISC. But Las Vegas was redone at great expense by SMI, and so was Texas — several times in a decade, in fact, until they got it right. When discussing this topic this week in the comments section of another article, I wrote some folks thought I was flat out crazy to even suggest modifying the two plate tracks. They assured me, as some do weekly, I have no idea what I’m talking about. Maybe they do know more about racing than me, though this ain’t my first rodeo, Cowgirl. But I remember the words of the late Dale Earnhardt, certainly the greatest and most successful plate track racer of all time. Earnhardt scored a ton of wins at both Talladega and Daytona, and the last victory of his storied career was at Talladega. In the waning laps of that one, he drove from seventeenth to victory while making a stunning set of moves that left those of us who watched awed and amazed. Yet even after that win, Earnhardt didn’t mince words when it came to plate racing. “I don’t care what they say. This ain’t real racing,” he said after taking home another trophy. I figure Earnhardt knew a thing or two about stock car racing; but he’s not around to comment about it anymore due to that last lap crash in the 2001 Daytona 500. So, it’s time to stop the madness now. Spend the bread and end these grisly circuses. Dale Earnhardt, Jr. — Junior returns to the scene of the crime, the track where he last won a Cup points event two years ago this weekend. He’s due. Jeff Gordon — If Earnhardt hasn’t won this year, at least he’s been finishing well most weeks. If Gordon is to have any legitimate chance of contending for a title, he needs to turn things around starting now. Kyle Busch — The way this kid is winning right now on any sort of track, in any sort of vehicle NASCAR chooses to compete, he’s a factor any given weekend.